Australian police warned a fisherman charged with causing grievous bodily harm to an Irish father-of-two who died from a traumatic brain injury he is likely to face more serious charges, such as manslaughter or murder. Charlie McCarthy (32) died from injuries sustained in a street attack in East Fremantle, near Perth. He died around 24 hours after being struck in the head following a confrontation with two fishermen as he walked home with his Australian wife, Nicole, after attending a festive event last Friday night with friends. Mr McCarthy, who was from Aghada in east Co Cork, was confronted by one of the fishermen as he walked on Riverside Road to try to find a taxi home. Words were exchanged and a man then attacked Mr McCarthy. During the row, he was struck in the head near the temple, apparently with a heavy screwdriver-type implement used to help load a fishing speargun. A 34-year-old fisherman was arrested a short time later. Mr McCarthy, who worked for a local cable-laying firm, was rushed to hospital in a critical condition with traumatic brain injuries. His family immediately flew from Cork to be at his bedside. His life-support machine was turned off on Sunday night. Speaking to the Irish Independent, his sister Karina Dolan said: "His wife and his kids were everything to him. He was the best daddy in the world and his kids were his life." The last time she saw him was when he travelled home to Ireland for her wedding in September 2016. "Charlie was my pet, he was home last year for the wedding and that was the last time I held him in my arms. He had a heart of gold and he was never once in an ounce of trouble." Mr McCarthy emigrated to Australia in the early 2000s, but returned to Ireland with his wife. 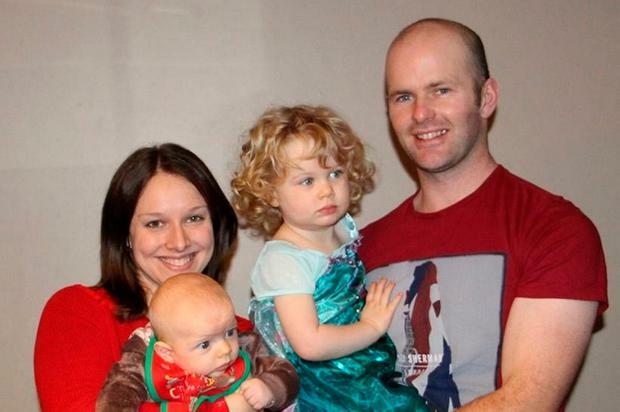 They returned to Perth in 2010 and set up home with their two children, Clara (4) and Niall (2). Police have charged a man in relation to his death. Andrew Doan (34), with an address in Joondanna, was charged with inflicting grievous body harm and was remanded to appear again before a Perth magistrate on January 3. Police have already indicated the charge is likely to be upgraded to manslaughter or murder once the post-mortem is concluded and the investigation finalised. A solicitor for Mr Doan was reported by 'The West Australian' as making a bail application for his client, and insisting he had only reacted after being "charged at" on December 23. The court was told that Mr Doan would fully defend himself at any trial, and was a compassionate, kind and harmless father. However, police opposed bail, saying Mr Doan could face more serious charges in a higher court. Magistrate Dianne Scaddan adjourned the application, pending the outcome of the post-mortem.